And it’s not just the connections of fingertips on the same string. How do they connect from one string to another? For example, moving from third finger on the D string to third finger on the G string is a farther reach than moving the other way, since the G string is farther from your hand. Your muscle memory needs to take note of these things for you; your brain has enough to do and can’t understand these relationships in any intellectual way. Another cross-string example: Fingers feel closer together when going from 1st finger on a higher string to 3d finger on the next lower string, than if using the same pattern but on the same string. Sensing finger relationships is different from just placing fingers “correctly.” If you move the 3d finger from D string to G string, it will feel very different to your hand than moving to the same note (C, 3d finger on the G string) from a B (2d finger on the same string, a half-step away). There’s even more to it than than learning how two fingers on one string or even on neighboring strings relate to each other. Finger relationships also have to do with bigger patterns, such as the single pattern used for playing an 8-note major scale (if starting on open string, for example, we simply need the 2d and 3d fingertips to touch). There are simple and frequently-used four-note patterns as well, such as what I refer to as the “Frere Jacques motif” — 0120, 1231, etc. You can painlessly become familiar with all these basic patterns, with animated images, in Technique Video Group #3. I worked with a boy recently who was having a lot of trouble learning a simple tune. He had memorized which fingers to use when, and more or less understood the timing of the tune, but it was totally unpredictable as to whether he could get through a phrase of the tune or not. Sometimes he would play the correct finger but on the wrong string. I noticed that not only was his 1st finger too low but all three fingers were touching each other. Of course, this finger relationship almost never happens — normally only two fingertips on each string touch each other. What I realized was that he was totally excluding his ears by learning the tune by reading it and memorizing what notes or what fingers to use. Because his fingers had no sense of the relationships between them, his ears had no idea what the tune sounded like. It was no surprise to find out that in practicing, he focused on getting all the notes in order, but didn’t spend time listening to or playing with a recording of the phrases or the tune. Learning notes in this way is not musical and not very rewarding; it is more like busywork ordered up by a teacher. If the finger relationships are wrong, or if a player is not even aware of them, the ears cannot engage in helping learn and remember a tune. If the relationships are there, the ears know what the tune sounds like and can help you retain it. Even if the notes are not technically in tune, the relationships guarantee that you are hearing the tune correctly, and you can make simple adjustments to play in tune. If the relationships aren’t there, you’re at square one. This is why I invented (and patented) the Finger Finder, a slide rule serving as a quick visual reference showing the relationships of the fingers in all keys. I’ve been gratified to see many players enjoy and rely on their Finger Finder. 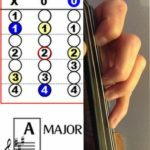 Some folks don’t understand why it does not show the names of the notes, but hopefully after reading this article, you will understand that knowing the names of notes is a whole different matter than learning finger relationships. Although note names are useful for communicating with other players, the relationships are the heart of playing well. If you have a Finger Finder, be sure to use it, and pick up whatever you can about the connections between fingers. You’ll enjoy the way animated images from the Finger Finder are included in the scale and note patterns in Technique Video Group #4. If you don’t have a Finger Finder, you can find one here on fiddle-online in the Credits Store, or from my site at this link, or from other sellers, such as Amazon, Shar, and Johnson.